The PresentationPro™ is the most widely spec'd & installed speaker in US schools. It's relied on to fill classrooms, libraries, and cafeterias with high-quality amplified audio. Businesses, conference facilities, rental firms and hotels use the speaker for its day-in and day-out dependability. The rugged PresentationPro is built for fast and easy set-up and installations. 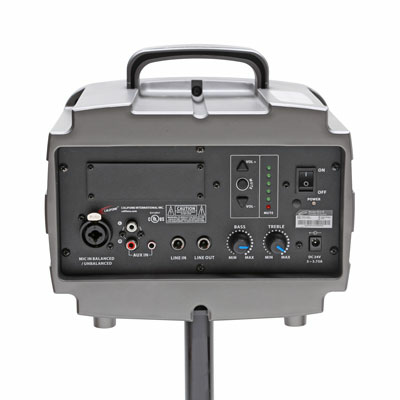 It features aux-in and line inputs to be readily connected to a computer, LCD projector, interactive whiteboard or other audio source. There's a line output to connect additional speakers and the PresentationPro accepts XLR and ¼” mic inputs for straight forward voice amplification. The flexibility of the PresentationPro make it a good investment for enhanced visual and audio learning where the entire class can hear the video or any other digital resource being used. The PresentationPro is one of the most efficient PA units on the market, meaning it doesn’t have to work as hard as other speakers to produce its big sound. The PA310 has the largest magnet in its speaker class, so doesn't have to be “pushed” as hard to produce its amplified sound. 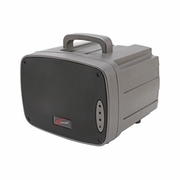 Its 30 watts are powerful enough for up to 350 people so a single speaker delivers additional audio support with a mic connection and the ability to attach another speaker, minimizing installation time and costs. The optional wall-mounting bracket for the PA-310 is the rugged two-piece MB-PA3W. It delivers a 180 degree horizontal pivot capability with a 90 degree vertical adjustment for optimal targeting of the sound field. comes with a rugged steel mounting bracket with slip-proof (sunburst) brass teeth to hold it firmly in place. Its PI-RC infrared remote control has a 20’ range and has volume up/down, mute and power on/off features. It magnetically attaches to the top deck of the PresentationPro so it won’t be lost or misplaced. The redesigned PresentationPro is a snap for use with a tripod (elevated sound always projects better) with a recessed pole cavity so no additional hardware is necessary.